Update: Bamboo Spark's new model Wacom Bamboo Slate is out. 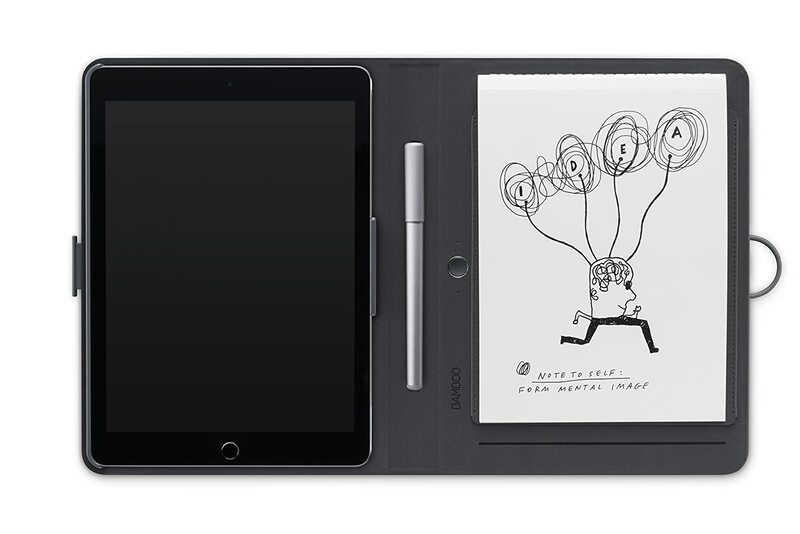 Wacom's Bamboo Spark is a device that will digitize your notes and sketches. 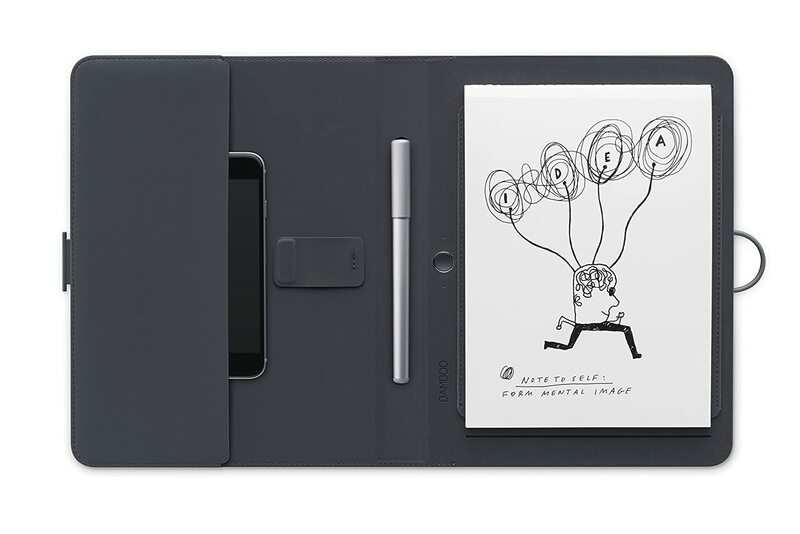 By that, I mean you can write or draw on paper, and the device would record your strokes and drawings into a digital file. It's like using a scanner except there's no scanner. Yeah, it's amazing in concept and this review will explore whether or not it actually works to its full potential. This is not Wacom's first attempt at creating something that works like this. The first was the Inkling released in 2011. Inkling had mixed reviews, mostly leaning towards the unfavorable. To give you the bottomline upfront, Bamboo Spark works surprisingly well. The 21-min video below includes the unboxing, setting up Bamboo Spark and demonstration of how it works. The text review below covers more, including updates to my experience. Bamboo Spark has two main components. The first is the big holder which looks like a tablet cover. The holder is where you put your writing pad and hold your accessories. The second is the Bamboo Spark pen, aka a ballpoint pen. You can actually buy the holder in three different configurations but they are all sized the same, slightly bigger than the 9.7-inch iPad. Exact dimension is around 206 x 253 x 30mm (8.1 x 10.0 x 1.2 in). They are all priced the same at retail USD $159.95. The Cover version is specially made to hold the iPad Air 2. Weighs 580g. Pocket version comes with a short sleeve to hold medium size items, e.g. phone. Weighs 535g. Sleeve version comes with a big sleeve that can hold a 9.7-inch iPad as well. Weighs 670g. If you don't have the iPad 2, it would make more sense to get the Sleeve version as it offers more space to hold more stuff. The Pocket version comes with a shorter sleeve and small things may fall out from the pocket. My review will cover the Pocket version of the Bamboo Spark. The Bamboo Spark holder is extremely well made. It looks good and feels durable. The exterior is some sort of finely woven cloth texture. Interior has dark velvet-like surface finishing. At the edge is a rubber band that will latch on to the front cover's hook to close the holder tight. In the Pocket version, the short sleeve stops at the halfway mark from left to right. There should be no problem if you put your phone there, e.g. problem of slipping out, because the inner velvet-like texture prevents slipping. There's also a small piece of magnetic flap. I wonder what's that for. Maybe to hold the extra ballpoint refills? Note that the Cover and Sleeve versions of Bamboo Spark don't have that. The ballpoint pen's exterior is smooth metal with rounded edges everywhere. It has a click-on type cap that post nicely at the back of the pen. The design is clean and classy for a mundane object like a ballpoint pen. The grip section has indents to prevent slipping from hand. The pen is normal size and comfortable to hold. It's not too light nor heavy. Before using, you need to pair the Bamboo Spark through Bluetooth with either the iOS or Android app, also called the Bamboo Spark app. The pairing process is easy, guided, and can be done within 30 seconds. Once paired, there's no need to do so anymore in the future. You'll need to use the big button inside the holder for pairing. There's a power switch at the bottom of the holder so you need to switch it on before using. The big button and indicator lights are important. Once it's powered on, indicator light turns green which means you can start writing. After your initial stroke, the light will turn blue instantly. After you finish writing, press the button and content on the page will be transferred to the software. Light turns green again waiting for you to write once more. You can leave your phone or tablet off while writing to conserve battery power. You only need to open the app before you want to save your work. If you forget to bring your phone, you can still use Bamboo Spark. It can save up to 100 pages with its internal storage for syncing later. Performance is very good, much better than I expected. Below are some pictures of actual scanned pages versus the digital capture. Click on each picture to see the enlarge version to compare them yourself. Bamboo Spark uses some sort of patented electromagnetic resonance method as mentioned by Wacom. I've changed the colour of the digitized strokes. Compare how accurate they are to the original scan. Note that Bamboo Spark is actually capturing your strokes one by one. It's not really capturing what is shown on the paper. For example, if you draw a dog on one page, flip over to the next page and draw a cat then click the button, you're going to get a picture of a dog and cat overlapping. What this means in real life is, sometimes as you write, your paper may move, and because of that, the lines captured by the app and the lines on your paper will be different. I was testing to see if Bamboo Spark was able to capture all my connected lines. I've also enlarged to cross hatching lines so that you can see clearer. Bamboo Spark is designed for note taking and handwriting. I find that it's 90-95% accurate in capturing where each stroke appears and end. In other words, I have no problems reading what I wrote on paper as well as what was captured by the software. Compared to digital styluses like the Fineline 2 or Adonit's many note taking styluses, writing with an actual pen feels more natural and effortless. When the ballpoint touches the paper, the green light turns blue, and with every touch the blue light will blink brighter. That blink indicates that the strokes are being captured. Bamboo Spark was able to capture almost all of my strokes at normal handwriting pressure. Strokes where the ballpoint is barely on the surface won't be captured. E.g. Strokes where you begin to lift the pen off won't be captured. Wacom says that Bamboo Spark support 1024 levels of pressure sensitivity but I doubt you'll see that much in actual use. The ballpoint pen does not give you strokes with varying thickness -- this is not a flex fountain pen, nor is it one of those Intuos tablets. Ink from the ballpoint is dark but not dark enough compared to other black ballpoint pens. This is not a big issue though. In order for strokes to be captured, you must use the Bamboo Spark pen. Bamboo Spark doesn't work with typical ballpoint pens, or any other pens or pencils for that matter. Bamboo Spark ballpoint refill measures 6.7cm. That's almost 50-60% in ink capacity compared to typical ballpoint pens. The diameter is also slightly smaller than typical ballpoint pen refills (I don't think you can cut and squeeze other ballpoint refills in this pen). You can go through each refill very quickly if you write or draw a lot. And since you cannot buy typical refills, you have to buy them from Wacom, and in the long run it could get expensive. Wacom currently has not listed the ballpoint refills on their online store yet but I'll update this review as soon as they do. The ballpoint refill's body is metal instead of plastic. I've tried the Zebra 4C refills with the stylus and while it does fit, Bamboo Spark will not detect it. You can use any A5 sized paper with Bamboo Spark. The thickness can be up to 50 pages. I tried it with a 200-page pad and it was not able to detect what I wrote on the first sheet. To make sure that Bamboo Spark captures everything you write, make sure you place the A5 paper in place correctly. Just make sure to place your pad of A5 paper between the two horizontal lines on the right side of the holder. The active area for capturing strokes is 148 x 210 mm (5.8 x 8.2 in). The holder needs to be powered. I've not tested the limits of how long the battery can last yet. There's a battery indicator in the Bamboo Spark app that will tell you how much battery life remains in percentage. I drew a few pages and it's down to 99%. My guess is it can work through hundreds of pages. Just remember to switch it off when you're not using it. You can charge the battery with the USB cable provide. It's the standard USB cable used by typical Samsung phones, Kindle, Google Nexus. The pen is not battery powered. As mentioned, it's pretty accurate when it comes to capturing what's on the paper. My main issue with drawing comes down to how often you need to replace the ballpoint refill. My heart aches a bit when I do cross hatching. By the way, cross hatching may not be accurately captured because sometimes the strokes can get quite light when you hatch very quickly. What can you do with the Bamboo Spark app? 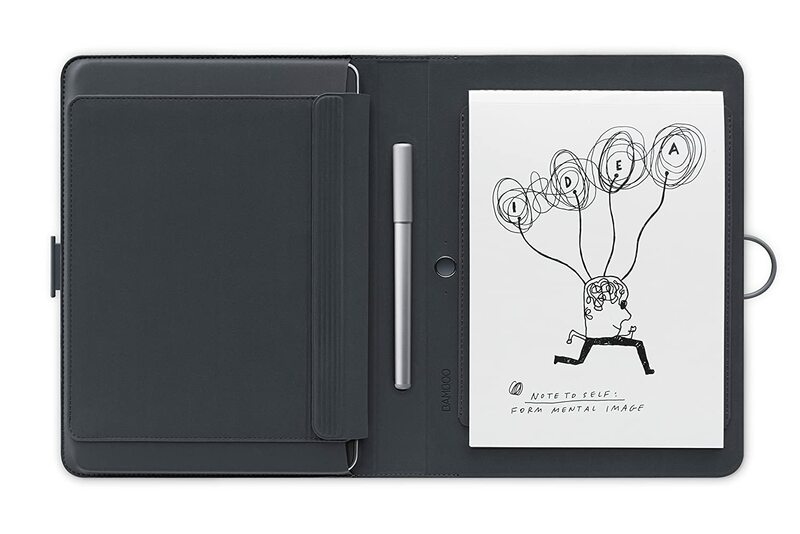 Once the page is captured, you can sync it to the Wacom Cloud, Evernote and Dropbox. You can choose to send the page, or collection of pages, as images (JPEG), PDF or Wacom Ink Layer Language (WILL). The PDF have the strokes in vector format. JPEG has a limited dimension of 1740 by 2480 pixels. You can also draw on the page you've just saved but only with a uniform line as there are no other drawing tools to choose from. The app has a time-based record of your work in progress. You can choose to view your work in time by scrubbing through a timeline, and choose to create an image (aka split) from any time in your progress. It's a cool feature but unfortunately you cannot export that time-based recording into a video. As an artist, the most useful thing I found is to export the page into PDF to be worked on further in Adobe Photoshop and Illustrator. In the drawing above, I had to close up some gaps before I could fill the colours in. If I had drawn more carefully to close the gaps in the actual drawing, I don't even have to touch up before I add colours. Generally speaking, if Bamboo Spark is designed for note taking, most people would be sitting down while writing. In real life, you would need a table to use the Bamboo Spark comfortably. It's not easy to hold this and write at the same time. I'm saying this because I have a lot of reporter friends who have to write notes while standing. It would be cool for the holder to have a place to hold the ballpoint refills. It works very well. It can capture strokes pretty accurately and I've not experience any bugs after several pages of drawing. Personally, I think this device is great for those who want the convenience of being able to digitize your page instantly. For example, if you're at a meeting taking down pages of notes, by the end of the meeting, you could select all the pages and email it to everyone at the table under a minute. It's also great for those who like to consolidate their notes into a collection. E.g. You're attending different classes, and at the end of the day, you can sort the notes into different folders. I can easily recommend Bamboo Spark to those who take a lot of notes. Where do I stand? As I'm more of an artist than a writer, I don't think I would get much use out of it. I mean I would use it occasionally for fun. Main reason is because I do have time to scan paper. I find it also rather limiting that you can only use ballpoint pen for drawing, not that I have anything against ballpoints. I love drawing with ballpoints, but I also love drawing with pencils, technical pens and fountain pens. When I'm at meetings, I don't take notes to share with other people nor do I have a need to digitize the notes. Is it worth the money? Yes. Ultimately, it does what it was advertised to do. I don't have major complaints except for the non-standard ballpoint refills which may run up the usage cost in the long run. But if Bamboo Spark can save you time, it may be worth it even so.